read and understood. Can I trade? People giving us some brief short info about what their post is about in the title. Some people like to write titles like ....... LOOKING FOR ......... FOR SALE LOTS OF STUFF .... NEEDED LIST ..... just to get the max amount of people clicking on them but it's quite frustating from the clickers point of view. Need List -- Pirates, SMDM and Big Jim stuff. This way people know what's in the thread before they click on it. 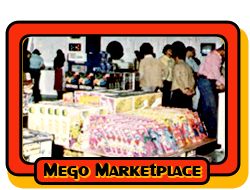 Dumb question, just double checking we can sell non-mego items here toys, action figures, etc. have KISS items that I'm considering selling or trade. If I want to list some custom stuff resin heads etc , can I list here? Copy right stuff etc. worry . . . . I Read Your Terms, and Will Agree with Them. Now Send Me My Mantooth Figure. We have an old saying in the field. Guidelines and rules are put into place for a purpose: To keep you safe and alive! Not quite that dramatic for the Mego Museum, but it will save you from losing money in the future! Lets read them over and over until it gets embedded in your head!